Flowing out of the Trinity Alps, the crystal clear Trinity River is dam-controlled and has guaranteed flows throughout most of year. Flowing between Weaverville, about an hour west of Redding, and Willow Creek, the Trinity is the largest tributary to the Klamath River. There truly is something for just about everyone on the Trinity, including both the Class V Burnt Ranch and several long stretches of Class II. It’s a long drive from the Bay Area, but once you’re there, you won’t want to leave. 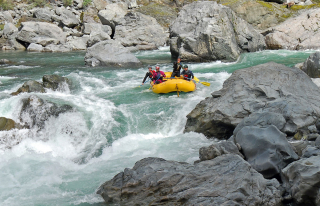 For Class V boaters, this is one of the best rivers in California. For many years, Burnt Ranch was considered unrunnable, but boats and boaters have progressed since then, and it is now a favorite amongst the advanced kayaking and rafting crowds. Through Burnt Ranch Gorge, the Trinity flows throughout the summer, is remote and never crowded, and is located in a beautiful canyon that cuts through the Ironside Mountain Batholith. If you put in at Cedar Flat, then the first 2 miles are a nice warm up, leading into a Class IV rapid, China Slide. Class V rapids such as Burnt Ranch Falls (a series of three class V rapids), Hennessy Falls, Origami, Table Rock, and Gray’s Falls will make your heart pump and your eyes wide. There is a nice ledge hole/ surf spot just upstream of Pigeon Point Campground. So if you arrive to camp the night before, head upstream on the trail and get in a little evening surf sesh. Big, rolling, class II and III rapids are the trademark of the Pigeon Point run, which is perfect for families, first time rafters, or anyone looking for a fun adventure with a low fear factor. Rapids such as Good Morning American, Z-Drop, Hell Hole, and Fishtail will keep the adrenaline flowing and the kids squealing with excitement. 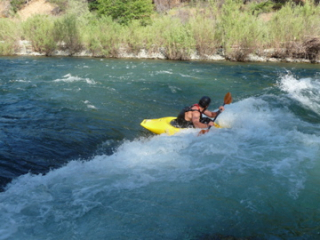 This run is great for first-time rafters, inflatable kayakers, and for kayakers ready to make the plunge into Class III rapids. Although the Pigeon Point run is all roadside along Highway 299, it runs through such a remote part of California that it still feels uncivilized. The hillsides are densely forested with pine, fir, alder, and oak trees, and the wildflowers in the springtime fill the canyon with beautiful colors. The Trinity is also a significant river for Salmon runs, although the Salmon populations have dwindled some in the past decade. Chinook, Coho, and Steelhead can all be found in the Trinity. Perfect for younger kids and wildlife lovers, the Lower Trinity is remote and provides a genuine wilderness experience. The rapids are Class II, mellow and splashy, and good for learning how to kayak or getting into an inflatable for the first time. Several tributaries have flowed into the Trinity at this point, so the river is higher volume, but the rapids are still family-friendly. Because of the lush vegetation throughout the canyon, wildlife seems to flourish along the lower Trinity.